The first thing to learn are the eight parts of speech. 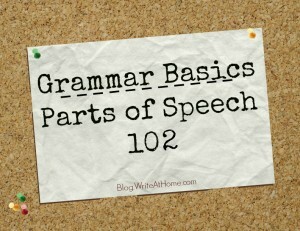 We covered the first three in the last post: nouns, pronouns, and verbs. Let’s do the next two: adjectives and adverbs. We keep adjectives and adverbs together because they are similar. Both adjectives and adverbs are modifiers. 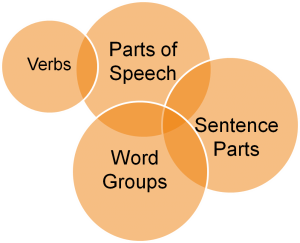 That means when you add them to a sentence, they modify (change, alter, specify, describe) other words or word groups. Thinking of them that way might help you remember. ADverbs and ADjectives modify words when they get ADDED. Some people like to use the word describe instead of modify. That’s fine. Usually that’s exactly what adjectives and adverbs do. The adjective tall in The tall man ran fast describes the man. The adverb fast describes how the man ran. Sometimes modifiers don’t exactly describe, however. The adverb not, for example, changes a verb from positive to negative. It modifies the word, but it doesn’t describe it. That’s why I like modify better than describe as the word to explain what adjectives and adverbs do. But if describe works better for you, go with it. The difference between adjectives and adverbs isn’t what they do; both modify words. The difference is in what kinds of words they modify. Adjectives modify nouns and pronouns. We’ve already learned about those. These are the naming words and the words that take the place of naming words. So if a word modifies or describes a noun or pronoun, it’s an adjective. Adjectives answer questions like What kind? Which? or How many? Which martian? The green one. What kind of trashcan? A smelly one. The important thing is to use your brain. Figure out what the word is doing and what word it’s modifying. Who’s friendly? He is. And he is a pronoun, so friendly is an adjective. What’s entertaining? The circus. And circus is a noun, so entertaining is an adjective. See how it works? Adverbs work just like adjectives, but instead of modifying nouns and pronouns, they modify verbs (adVERBS — get it? ), adjectives, and other adverbs. The car is bright red. Take that ice cream outside. Adverbs answer different questions than adjectives because you don’t ask How many or What kind about verbs and adjectives (What kind of run? How many red?). Adverb questions are How? When? or Where? When did he arrive? Early. How red is the car? Bright red. How loudly did she laugh? Very loudly. Where should I take it? Outside. Notice that early modifies the verb arrive. Bright modifies an adjective — red (which modifies car). And very modifies another adverb — loudly (which modifies laughed). In order to recognize adjectives and adverbs when you see them, you need to know your nouns, pronouns and verbs first. Then you have to notice that these words are answering questions about those nouns, pronouns, and verbs. That’s telling you they are modifiers. If they answer questions about nouns and pronouns, they are adjectives. If they answer questions about verbs, adjectives, or other adverbs, they are adverbs. Articles don’t modify nouns quite the way other adjectives do. They sort of introduce them: a man, the fish, an apple. We don’t need to talk any more about articles; just remember that they are adjectives. Now that you’ve learned about modifiers, here are a few more quizzes to test your understanding. They are a tiny bit trickier than the quizzes in the last lesson, but you shouldn’t have much trouble. Once you’re done here, go on to Parts of Speech 103. Leave your comments, questions, and suggestions below!